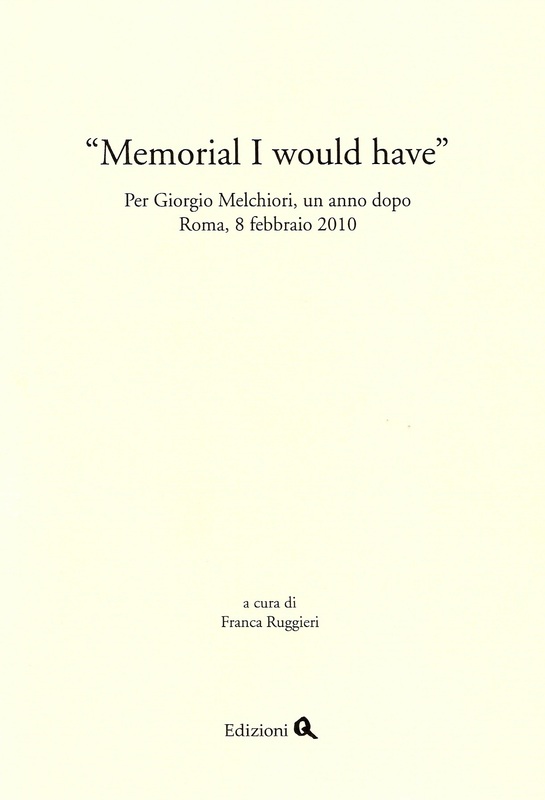 “Memorial I would have” – Per Giorgio Melchiori, un anno dopo (Edizioni Q, 2010) is a tribute to Giorgio Melchiori, the scholar who made such an indelible mark on the history of English studies. Published with the financial support of IASEMS, the Italian Association of Shakespearean and Early Modern Studies, the volume collects the contributions of those who gathered a year after his death, on 8th February 2010, to commemorate the Italian Joycean and “Shakespeare critic of his generation who was most well known abroad”, as we read in Carla Dente’s foreword. “Memorial I would have” includes texts by Franca Ruggieri, who also edited the volume, Renato Oliva, Piero Boitani, Toni Cerutti, Carla De Petris, Vittorio Gabrieli, Lucetta Geymonat, Cristina Giorcelli, Fabio Luppi, John McCourt, Michele Marrapodi, Francesca Romana Paci, Pierluigi Petrobelli, Paola Pugliatti, Jacqueline Risset, Laura Santone, Biancamaria Tedeschini Lalli and Carla Vaglio Marengo. Miranda Melchiori contributes a complete bibliography of her father, including a list of unpublished manuscripts and lecture notes. The book is not available in bookshops, but those interested in acquiring a copy should make a request to joyce.foundation@uniroma3.it.